When a fire broke out in the cathedral’s library aisle, there was no mains water to fight it — the blaze was eventually suppressed with ­stirrup pumps, buckets and sand. Then, soon after 6.30pm, an incendiary bomb — one of 29 to fall on and around St Paul’s that night — pierced the lead roof of the dome and lodged in its timbers. Molten lead began to drip into the nave below. The aged wood of the choir stalls and organ screen, carved by the great sculptor Grinling Gibbons, was at mortal risk, while smoke from the blazing buildings surrounding the cathedral enveloped it. Two teams of specialist fire watchers recruited from the Royal Institute of British Architects — and hand-picked because they had heads for heights — were ­crawling along the wooden beams with hand pumps to reach the ­blazing section. But suddenly the incendiary bomb, having burnt through the wood, fell far, far to the nave below, where it was easily put out. Though almost every building around St Paul’s ­perished, the cathedral survived. This pump was filthy when I bought it and has been carefully washed with hot soapy water. 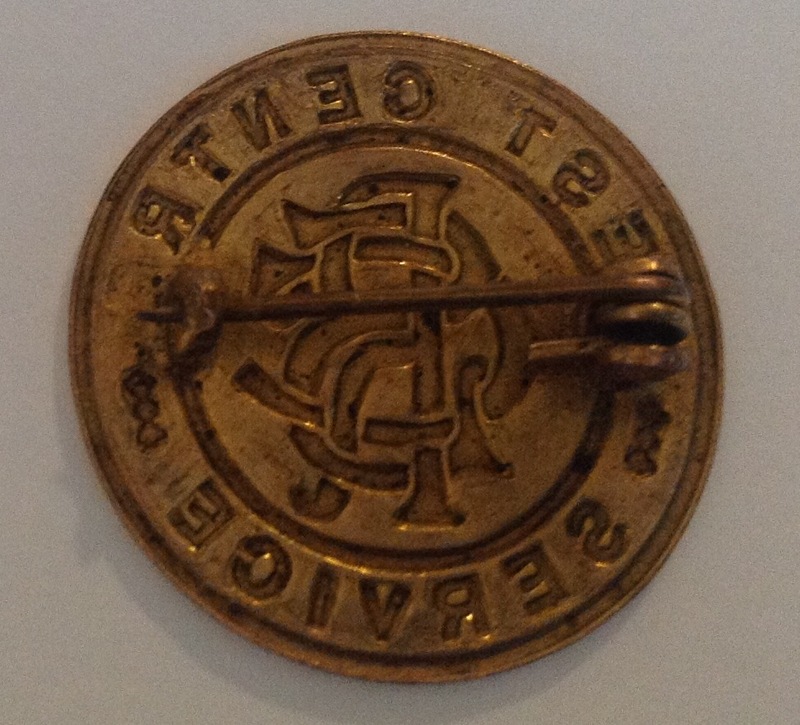 It is far from perfect, but for the price was a fantastic find and it is different from my earlier example. This entry was posted in ARP, Blitz, Home Front, WW2 on April 6, 2019 by hatchfive. The area as a whole has again been divided into Divisions covering 84 stations now established. The total administrative strength is 226. In August 1941 the territory now known as No 5 Fire Force Area consisted of 33 local authorities, each possessing fire brigades and AFS organisations of varying sizes and types. These were spread over some 900 square miles and contained the major portion of the woollen and worsted industry, with a population of approximately one million. A very important part of this country and a vital one from an industrial point of view. The regulations provided for this to be taken over in so far as fire cover was concerned, “lock, stock and barrel” both operationally and administratively. Operationally it meant the organisation of large numbers of pumps, special appliances and personnel into a unified Fire Force in divisions, and the establishing of an effective system of control with a definite chain of command. This involved new headquarters and control rooms, a complete new lay out of telephone communications, new stations and improvements to existing ones. It involved the up of schools for both men and women where instruction could be given on a nationally adopted standard and where women could be taught to take over duties previously carried out by firemen and thereby release the latter for active fire-fighting duties. It involved the construction of static water tanks with a total capacity of millions of gallons, the laying of 12 1/2 miles of steel piping and the building up of a predetermined water relay system for the purpose of delivering water to the fire ground and replenishment of supplies. This entry was posted in Blitz, Documents, Home Front, WW2 on February 5, 2019 by hatchfive. 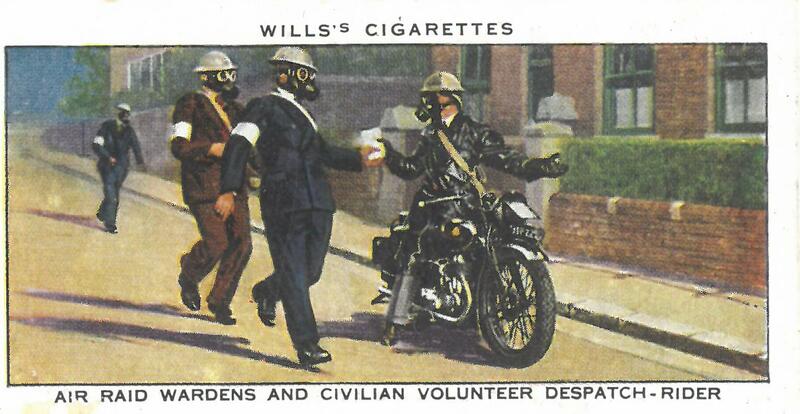 Most of the time when we look at the work of charities in wartime on this blog, the story is one of heroic and hardworking volunteers providing an essential service under trying circumstances. Tonight’s story is rather different and shows the infighting and administrative chaos that could arise from well-meaning people having differing priorities and aims without strong leadership to move them in the same direction. Britain had a large number of charities supporting animals, many dating back to the late Victorian era. Some of these are still with us today such as the RSPCA and the PDSA, others such as ‘Our Dumb Friends League’ are now forgotten to history. At the start of the Second World War it was recognised that there was a real danger to domestic and farm animals in wartime and something had to be done to provide help to owners. The Nation Air Raid Precautions Animals Committee (NARPAC) was formed to provide an umbrella organisation to coordinate the activities of these different charities. Tonight we have a leaflet from their formation, the front cover of which gives a list of the main charities involved: The organisation saw two main aims for itself during wartime, which it set out in this leaflet. 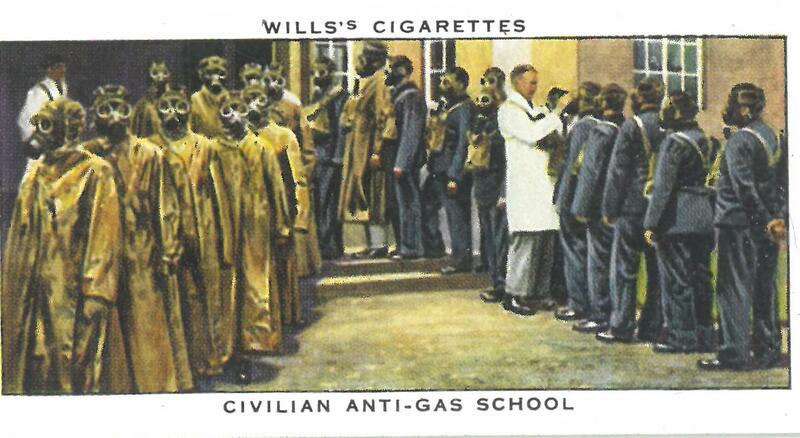 Firstly it was to provide shelters and veterinary care to animals caught up in air raids. 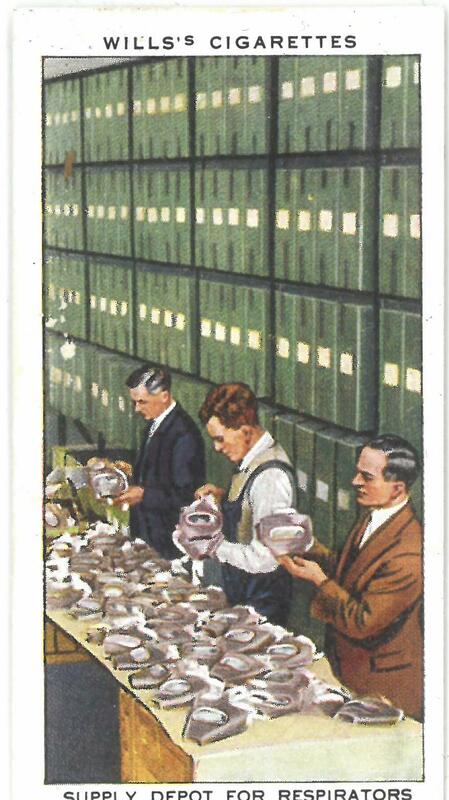 Secondly it sought to create a central register of pets to allow lost animals after a raid to be identified and returned to their owners (Click on the image for a larger version): In order to achieve this aim the committee needed funds and the back page of the leaflet gave readers instructions on how this could be achieved: Unfortunately, despite its lofty ambitions the charity never achieved its potential. Firstly there was a lot of competition between its constituent charities. Most relied on wealthy benefactors for the funding to sustain themselves, whilst others preferred small scale fundraising such as jumble sales. With ever greater pressures in wartime each charity and its board was competing with the other organisations in NARPAC for the same diminishing pot of money. This lead to infighting and accusations of charities encroaching into the fundraising spheres of one another and consequent bad feeling. Added to this was that many people did not have the time to devote to the organisation, as ARP duties, fire watching, work and volunteer organisations such as the WVS used up much of people’s time. In 1939 NARPAC had 47,000 Animal Guards, by October 1940 this had fallen to 16,000- the official record admitted that the drop was due to ‘boredom and local quarrels’. At a higher level there was deep rivalry between the RSPCA and the PDSA and ODFL- the RSPCA seeing the latter as extremists due to their views on fox-hunting. Into this toxic mix was added the problem that there were not enough funds to cover the costs of the animal registration fees and that most owners were more concerned with the day to day problems of finding food for pets with wartime rationing. 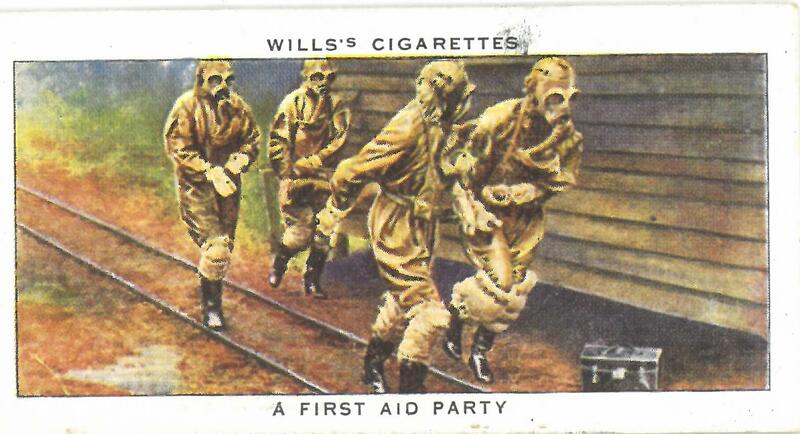 It is unsurprising then that NARPAC never lived up to its potential and is today a footnote to the story of wartime civil defence, with small pieces of ephemera such as this leaflet one of the few reminders of the role it might have played. This entry was posted in Blitz, Documents, Home Front, WW2 on November 3, 2017 by hatchfive. 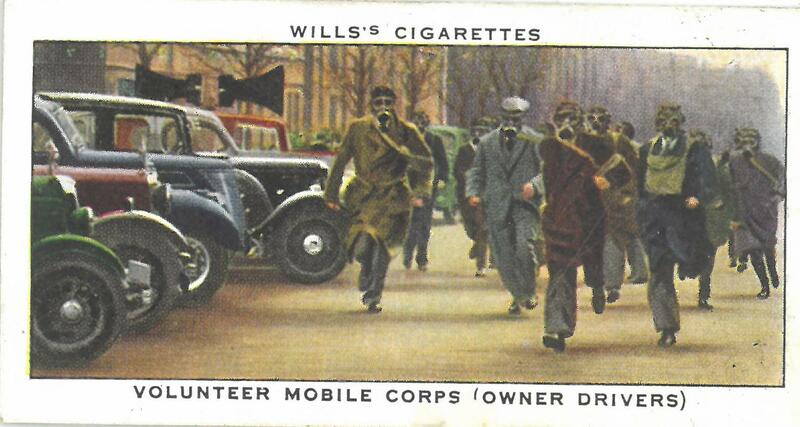 In those days we had no equipment other than our Civil Defence armbands. There were two steel helmets at the Report Centre which we had to share. A messenger was not allowed to go out unless he was wearing a “tin hat”; consequently if a message had to be taken out the Messenger had to wait until another Messenger came in before he could go out to deliver the message. This entry was posted in Blitz, Home Front, Insignia, WW2 on October 9, 2017 by hatchfive. Previously we have looked at an example of a canvas bucket that was part of an officer’s traveling camp kit. These are of course not the only examples of canvas buckets in service during the Second World War and tonight we are looking at another example, with some different constructional details to the previous example. This bucket is made from a pale green canvas again: Unlike the other bucket though, the handle for this bucket is made from a thick piece of cotton webbing, rather than a piece of rope: Note how the handle has been doubled up and stitched for strength over the centre part. Inside the bucket is a faintly stamped marking, indicating that it was made in 1939 by Speedings Ltd of Sunderland: This factory was founded in Sunderland in 1827 and is still in business today, making it one of the oldest companies in Sunderland. 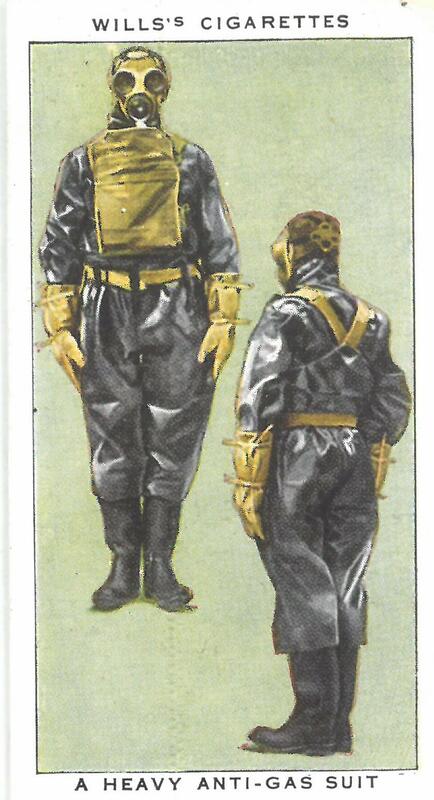 They have produced sails, canvas products and flags and today make protective equipment for the emergency services. To return to the bucket, there is another marking on the inside that is very faint and I have struggled to pick up on the camera, that is a GR and crown mark. Searching around I am fairly confident in saying that this design of canvas bucket was issued to the Auxiliary Fire Service in the early years of the war. I have seen other identical buckets with black stencilled markings on the outside that indicate they were used by the AFS and this seems a likely user of my example. Canvas buckets were very useful for carrying on small AFS fire tenders; large numbers could be carried without taking up much space and bucket chains could be set up using volunteers passing them between each other to help put out small fires. One night I was awoken by my parents. We had been bombed and two incendiaries had gone through the roof. Father was in the loft with a stirrup pump and a bucket chain had been formed with people passing buckets of water up the stairs. Water was being poured into the stirrup pump bucket too fast and was missing it, then father put his foot into the bucket —“ Pour it down my b—- leg”, he said. As mother carried me past the hatch, down the stairs and by the bucket chain into the garden to the Anderson Shelter, I could see flames in the loft. I doubt the buckets here were canvas ones, more likely anything the household could get hold of, but the fire was put out and it shows how useful this simple operation could be. This entry was posted in Blitz, equipment, Home Front, WW2 on October 6, 2017 by hatchfive. In the summer of 1940 I was an 18 year old working as a clerk for the London County Council in Bethnal Green, East London, and the only prospect I could see was waiting for my age group to be called up for military service. 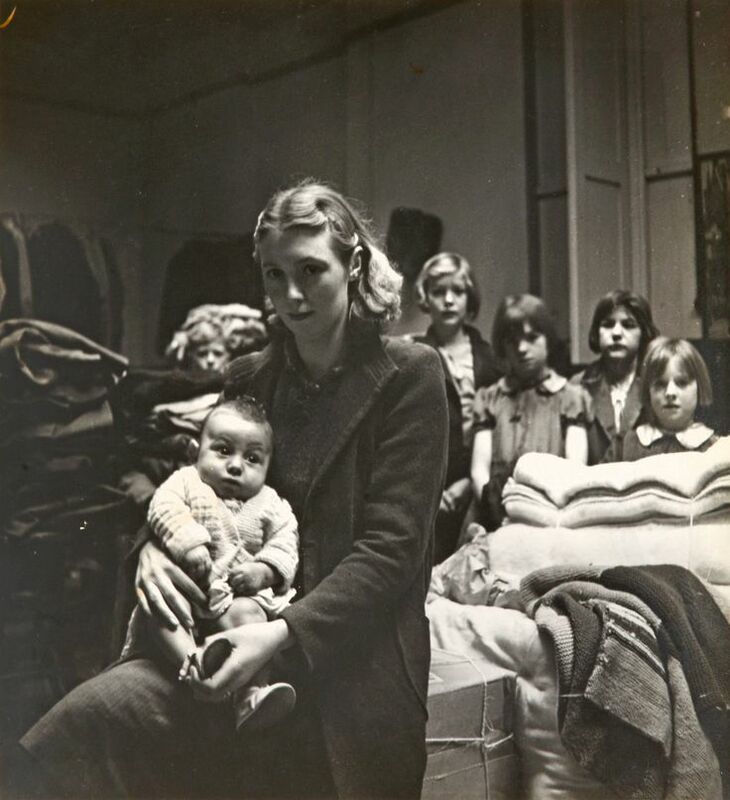 Our office was on stand-by for manning Rest Centres at a nearby school, which was equipped to receive bombed-out refugees if air raids on London started. Until the ” Blitz” in the autumn that meant sleeping in camp beds in the office on a rota basis, playing cards and deciding who was to be the cook. Eventually on 20th October I was called to Rest Centre duty as bombed-out East Enders started arriving: for two months I worked 24 hours on and 24 hours off at Globe Road School in Stepney (empty as all the pupils had been evacuated to the country), tending to the needs of bombed-out families who trudged to the school with what they could salvage from their destroyed houses. The school, and many others had been stocked many months before with tea in chests, sugar in sacks, tinned food, blankets, mattresses etc. I remember the cheerfulness of the Cockneys, who quickly settled in and were soon even singing. Every morning we phoned J. Lyons caterers with the numbers of people and at lunchtime the desired number of hot meals arrived in an insulated van. The organisation and forethought was impressive and helped to alleviate the suffering of the refugees. I mostly travelled the eight miles to and from my home by bicycle – with the disruption of public transport it was more reliable, though the rubble and broken glass everywhere meant frequent punctures. They were exciting times for young people, and I do not remember any down-heartedness or defeatism. 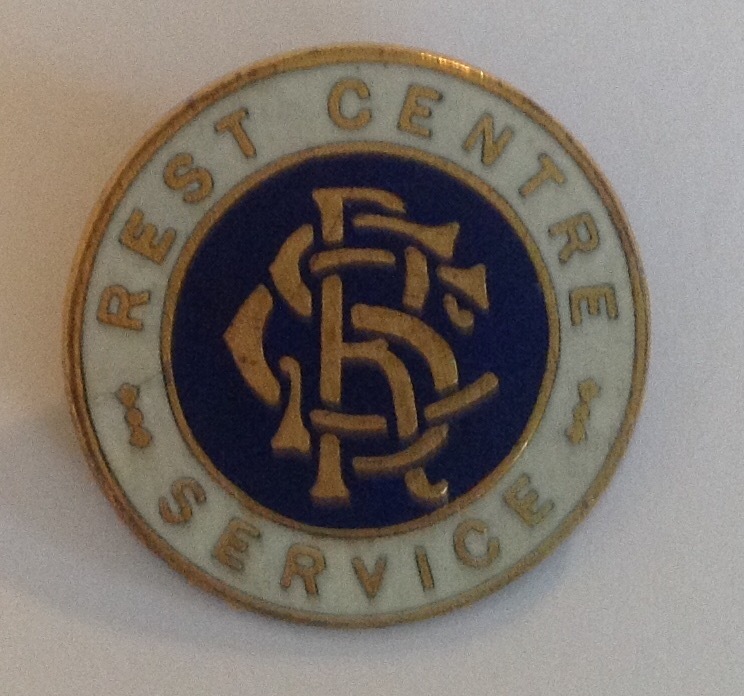 In December I enlisted in the Home Guard and left the Rest Centre Service to others, and resumed work in the office which enabled me to perform my Home Guard duties in the evenings and weekends. This entry was posted in Badge, Blitz, Home Front, Insignia, WW2 on June 3, 2017 by hatchfive. 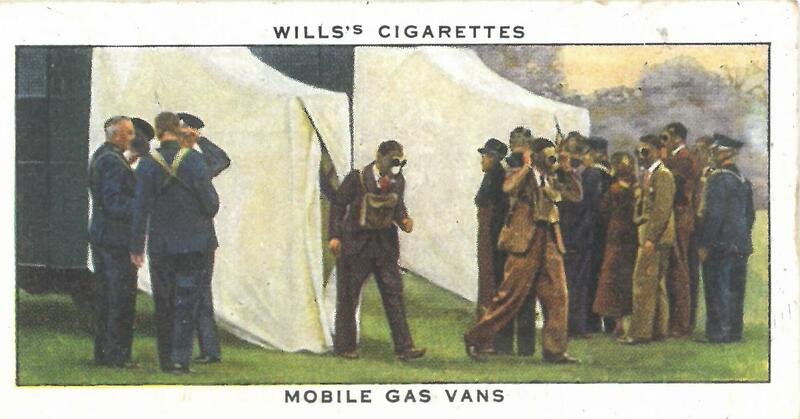 We come to our third and final post on the Will’s ARP cigarette cards, looking at another ten examples form this set. I have now managed to add a full set in the album to my collection so we may come back later and look at the other twenty cards in due course. 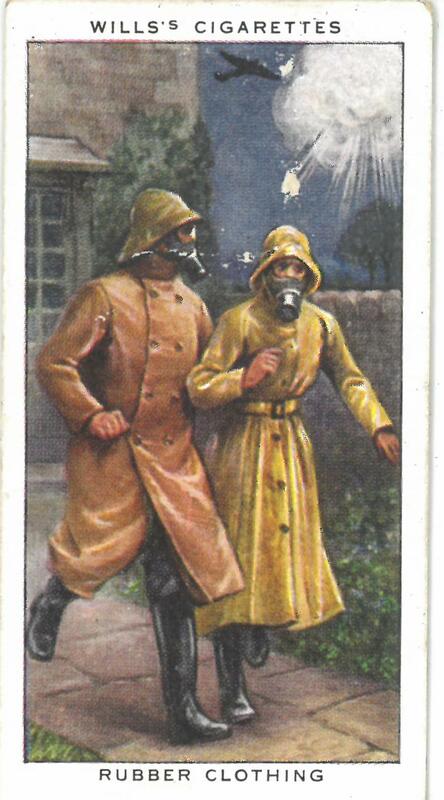 During an air raid the safety of the citizen may depend to considerable extent on his knowledge of how to behave. Splashings from the liquid liberated form certain gas bombs, or subsequent contact with it, produce a serious blistering of the skin. 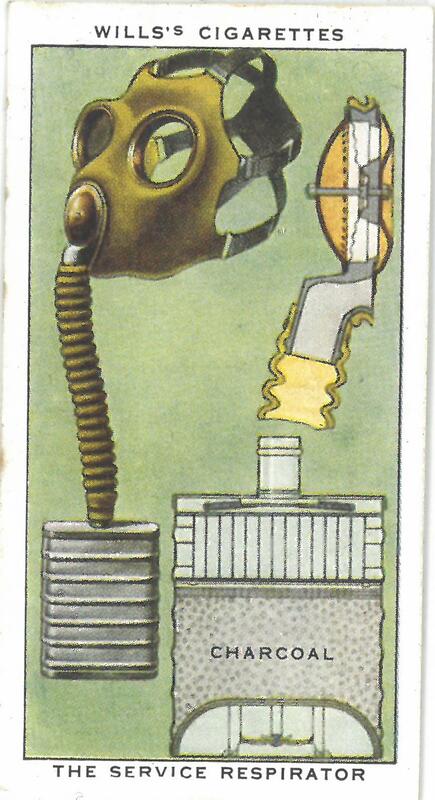 The Government provides each individual with a respirator which is complete protection for the eyes, throat and lungs. Prudent persons, if forced to go out of doors during raids, should provide themselves, in addition, with rubber or oilskin coats and hats, and rubber boots. 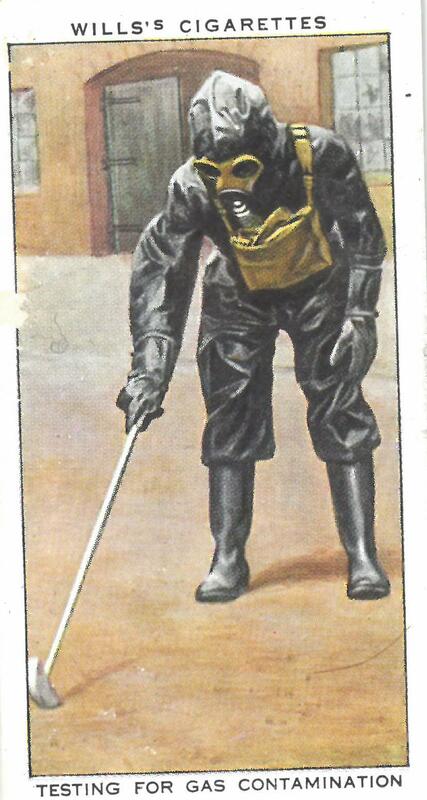 The picture shows a member of a Decontamination Squad using an instrument for detecting if the ground has been contaminated with mustard gas. The instrument is painted at the end with a special paint which, when brought into contact with mustard gas, will turn a different colour. The man is shown wearing protective clothing and his Service Respirator, but as he is working after the raid is over, he is not wearing his steel helmet. This entry was posted in ARP, Blitz, cigarettes, Home Front, WW2 on March 3, 2017 by hatchfive.